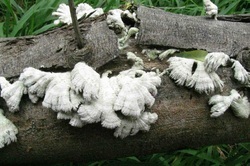 Many types of fungi grow on fallen timber in the sites. Biodiversity simply means the variety of life on earth – the different plants, animals, fungi, micro-organisms and the ecosystems they form. There are three levels of biodiversity – species diversity, genetic diversity, and ecosystem diversity. IWEG wants to preserve and enhance all three. We are improving species diversity by planting a very wide range of plant species, more than 70 at sites such as Waratah Mills. 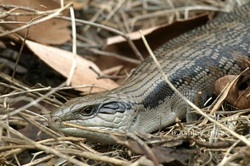 Eastern Blue-tongue (Tiliqua scincoides scincoides). We are also aware of the need to preserve local genetic diversity so wherever possible we plant tubestock propagated from locally sourced seed. That ensures the plants are best suited to the local micro-climates and soils where we are working. It also helps prevent Sydney’s native plant communities being dominated by just a few strains of a certain species, which could lead to inbreeding and compromise the long-term viability of the species. We can’t directly control the movement of wild animals, but we can create conditions favourable for them to forage, breed and nest. In fact, even though we are a primarily a bushcare group, one of our main aims to encourage native animals – birds, mammals, reptiles, insects – back into the inner west.